The fossilized remains found in an Eocene Epoch (37-58 million years ago) lakebed. The unique Fossil Butte circumstances have produced remarkably detailed skeletons of thousands of prehistoric fish. As you drive up to the Fossil Butte Visitor Center, there is not much to distinguish the land around you from what you have been driving through for hours (and hours). Scattered sagebrush and large flat buttes pick up light and shadows and occasionally become quite colorful. What gives Fossil Butte its beauty lays inside the walls of the Visitor Center. Replica and original fossils collected from the ancient lakebed could easily be mistaken for exhibits in a gallery. They are almost perfectly preserved and artistically displayed. Turtles and sting rays look more like Indian pictographs or stylized sculptures than what they really are – a bunch of bones. Like at Florissant Fossil Beds NM, conditions at Fossil Butte combined to create some of the most perfectly preserved remains of ancient plant and animal life in the world. Scientists are still debating exactly what those conditions were. The site video shows paleontologists lifting layers and cutting sections of limestone and pulling out fossilized imprints of fish so detailed you can count their scales and teeth. Fossils from Fossil Butte provide clues to climatic and environmental changes 50 million years old. Fossil Butte is one of the coolest kinds of National Park areas, one where research and discovery are still taking place on a daily basis. More people than we expected on this dreary Sunday morning, but they didn’t affect our visit in any way. The Visitor Center isn’t large, but it uses its space nicely. We don’t think there way anyone on the two walking trails. On the condensed Rand McNally Wyoming map, Fossil Butte NM seems deceptively close to Grand Teton NP to the north. It is not, clocking in at about 150 miles south down scenic two lane U.S. Route 89 and then U.S. Route 30. The biggest town along the way is Afton, Wyoming. Haven’t heard of it? It’s the hometown of gold medal Greco Roman wrestler Rulon Gardner. 60 miles to the south is Interstate 80 where Salt Lake City lies about 90 more miles to the southwest. You will not happen onto Fossil Butte NM, you have to find your way there. Cool stuff here. An entire shelf was dedicated to titles about teaching children how to appreciate nature and essays on environmentalism. The intriguing Correlated History of Earth poster was for sale here. Gab purchased a book of anecdotal stories entitled, Oh Ranger! written by the man himself, Horace Albright. The signature item at Fossil Butte NM are framed replicas of several fish fossils available in several sizes and price ranges. We told you they looked like art. Michael tried to give the Ranger the National Parks Pass to no avail; the Site is free! One Ranger greeted us as we entered the Visitor Center. Just as we were wondering if he was alone, two more emerged from the back room where they were avidly following the Chicago Bears football game. We laughed when we realized that we weren’t the only ones sneaking back to the radio to hear how our teams were doing this Sunday morning. There wasn’t too much on offer in the off-season. From June to August, however, there are daily 20-minute “summer porch programs,” evening programs, including programs on the cultural history of the area on Thursdays. Every Saturday and Sunday in the summer paleontological staff actually take visitors out to the quarry and let them observe the collection of fossils. The 30-minute film was very well done. Gab even took notes. Fossil Butte NM offers not only a Junior Ranger program, but a Senior one as well!! We wish we had noticed this during our visit. More than once we have wished for a younger traveling companion so we could cash in on those cool stickers and patches. We could have here! Curses! Part of the Visitor Center is a windowed room dedicated to the preparation of fossils, complete with cleaning tools and microscope. To get your Junior or Senior Ranger badge, you need to make use of this room. We have not seen many sites that offer so many hands-on opportunities. Once again, a site we thought we would breeze through took over two hours to enjoy. That’s without walking the trails. Gab was mesmerized by the film, which tells the history of the area and walks you through a modern day preparation of a fossil removed from the lakebed. Michael, although pre-occupied with the St. Louis Rams poor performance, still found time to dwell in the museum. The bookstore, although small, was worth perusing. Fossil Butte was distinct from the other fossil-based sites that we had visited. It didn’t follow the mold of: here is the Visitor Center and there is the quarry and just trust us, the fossil are there. Many of the fossils in the museum are the real deal. And had we been there a little earlier in the year, we could shared in the scientific collection of the fossils out in the field. How cool is that? Fossil Butte is off the beaten path. If fossils are your thing, there are few other places that will let you get this up close and personal with remnants of prehistoric America. An 82-mile section of road that travels from West Thumb Geyser Basin in the southern portion of Yellowstone NP and follows through Grand Teton NP all the way to its southern entrance and Jackson Hole, Wyo. The Parkway also encompasses the land between the two parks, some of which John D. Rockefeller, Jr. bought in the 30’s and donated to the National Park Service in order to preserve it for public use. The portions of the John D. Rockefeller Memorial Parkway within Grand Teton NP are breathtaking. The jagged peaks just stand there, majestic, without obstruction. The Parkway offers countless pullouts, picnic areas and snapshot chances. The Parkway remembers Rockefeller’s philanthropic commitment to our nation’s public lands. His land purchases ensured what he hoped to be the everlasting protection of the Great Smoky Mountains NP, Acadia NP, Grand Teton NP, the Virgin Islands NP and more. We are thankful to foresight of Mr. Rockefeller and other like-minded industrialists who treasure the public’s enjoyment of our beautiful country. Despite the beautiful surroundings rife with wildlife, most of the Parkway’s visitors still drive well over the posted 45 mile and hour speed limit. It is hard to enjoy nature when gargantuan pick up trucks and/or RV’s are aggressively tailgating your humble Nissan Altima. Even though there a pull offs for cars going the speed limit, the stress level of driving the Parkway, especially the sections in Yellowstone NP can be particularly high. Large portions of the Parkway’s northern section are under construction and amount to one-way unpaved gravel conduits. Waits of up to a half an hour are more than likely. The Parkway cannot be accessed without entry into either Yellowstone or Grand Teton NP’s. The Parkway’s bookstore, located at the Flagg Ranch, closed for the season in early September, leaving us one National Parks Passport stamp short. We could see it through the door’s window and left distraught. A $20 vehicle entrance fee is good for a week’s stay at both Yellowstone NP and Grand Teton NP, an incredible bargain given the sheer amount of things to in the Parks’ combined 2.5 million acres. Entry is free with the National Parks Pass. There is an outsourced campground available near the Flagg Ranch Lodge in the Parkway portion in between the two National Parks. Reservations can be made for the $25 a night sites. Pretty steep by our book. Lodging is available at the newly built Flagg Ranch Resort for $145-$155 per night. The Ranger Station, along with the bookstore, closed for the season in early September. If you sincerely have John D. Rockefeller, Jr. related questions we are sure the Ranger at Grand Teton NP will be able to help. Only a roadside exhibit conveniently positioned right before the flagman stops traffic. From the view Michael had, face pressed up against the glass, it did not look like there was a museum at the closed Ranger Station. How much fun can driving through a 30 miles of construction and unpaved roads really be? Pretty fun indeed, when the Grand Tetons are your destination. Once the traffic holdup ends, the Tetons stand to your right. For over 50 miles! Location. Location. Location. The Parkway receives a mandatory perfect score here since it is your only paved route through the stunning Grand Teton NP and part of Yellowstone. A thin spine of magnificent mountains, twelve rising over 12,000 feet, which stand, unobstructed by foothills, over glacial lakes and rippling meadows. When we easterners imagine the splendor and the romance of the Rocky Mountains, we are picturing the sharp-toothed peaks of the Tetons. The mountains are never an abstraction; you never have to guess their height. You see everything, their base, their steepness and their snowy peaks. The landscape, from the Snake River to Jackson and Jenny Lake, to the wet meadows, to the sagebrush flats to the naked mountains is extraordinarily beautiful. We did not learn much history during our stay at the Park. If you are looking for historical fulfillment, the often geographically out of context Indian Art Museum might quench your thirst. John D. Rockefeller helped ensure both the Park’s protection and eternal public access by purchasing a great many acres that are now part of Grand Teton NP. At midday, the lower altitude trails around Jenny, Bradley and Taggert Lakes were all full of hikers, but most greeted us with pleasant smiles and warms hellos. We were all so happy to be hiking in such an astonishing place on perfect weather days. We started the 13-mile round trip hike to the Forks of Cascade Canyon late. When we reached the 7.5-mile turnaround point, two twentysomething girls were resting near the directional sign leaning on their stuffed-for-a-few-more-backcountry-nights packs. They warmly greeted us; we warned them of the incoming snowstorm. They had not heard of the weather pattern, leading us to believe that they had not seen many people at all during the three days out on the Teton Ridge Trail. They were so nice and looked so happy and content that we both immediately thought, “we have got to get out in the backcountry soon and away from the easy joys of car camping and day hiking.” We turned around inspired. When we reached Inspiration Point on the return, there was no one else there. We enjoyed the peaceful view of Jenny Lake by ourselves. Grand Teton NP is a destination site and not particularly close to a large population center or an Interstate. Idaho Falls, Idaho, as well as Interstate 15 is 90 miles to the west of the South Entrance. The faux western, nouveau riche and wildly expensive resort town of Jackson, Wyoming is the portal to the park. It stands at the south entrance and has an International Airport. The east entrance is a long way from nowhere and the north entrance leads only into Yellowstone National Park. Once you find your way to the Tetons, the Park is accessible. There are numerous lodges on Site and roads take you to the foot of the mountains. Overlooks abound and hiking tails take you everywhere. Whoa. The Visitor Center bookstores, especially at Moose, have oodles of Grand Teton-related books. The kids section takes over ten shelves. A large and extremely lifelike raven puppet enamored Michael and a female octogenarian just off a bus tour. Both placed their hand in the puppet, made raven sounds and pestered their spouse with the toy’s leather beak. Fun in bookstores. The National Park Service operates five campgrounds in Grand Teton NP, a total of 913 campsites. All Sites are $12 per night. The Park literature warns that all but the 372-site Gros Ventre campground normally fills by 2:00 p.m.
We stayed at the popular 50-site, tent-only Jenny Lake campground. This Site normally fills by 8:00 a.m. and was at capacity during our stay despite sub-freezing nighttime temperatures and a snowstorm threat. There are three well-manned Visitor Centers along the Park’s 51-mile north-south road. The Colter Bay Visitor Center included a refreshingly ebullient Ranger working the Backcountry Permit window who eagerly inundated us with more hiking information than we could handle. During the summer months, there are numerous Ranger-led hikes along the lakes and mountainsides, talks at the Visitor Centers and nighttime campfire programs at the lodges and campgrounds. Planned activities drop off considerably the rest of the year. The Colter Bay Visitor Center includes an Indian Arts Museum. The Museum has a tremendous amount of moccasins, beadwork, clothing, you name it, on display. The exhibits show the personal items and artistry of many different Indian tribes, some of which never resided anywhere close to the Tetons. We found it confusing and overwhelming. We find it easier intellectually to travel to Site’s and Museums dedicated only to that areas indigenous tribe. But if you don’t have the luxury of time, the Colter Bay Indian Arts is not a bad alternative. The Jenny Lake and Moose Visitor Centers center around dinner table-sized topographical maps of the Park. We attended only one Ranger talk, at Moose, which took place around that same map. It was a pointer on hard plastic introduction to the Park and it was crowded. We tried hard, but failed, to nudge our way in to get a view of the map. So we left. We had already spent a few days at the Tetons so we probably were not the aimed demographic. We did not attend the Ranger classes because we were having such a great time hiking the mountains. We were ably assisted by terrific (and free) map and trail guides provided by the Park. You just have to ask for them. The pamphlets explain many hikes, point of wildlife tidbits and give surprisingly detailed topographical information. The Taggert and Bradley Lakes map even shows the correct number of switchbacks on the way to Amphitheater Lake! While on the hike, Michael eagerly counted down all fourteen. As if watching the majestic Teton peaks getting closer and closer as we drove straight down from Yellowstone wasn’t exciting enough, by the time we finished talking with the Backcountry Ranger at Colter Bay we were nearly falling over ourselves rushing to get a camping spot, dump our stuff and head right into our first hikes. We found one of the few remaining sites at the beautiful Jenny Lake campground, set up camp and set out while the sun was still shining. Each walk we took had what Gab likes to call, a “payoff.” Something beautiful that can only be reached by foot: justification for your trek into the canyon or up the hill, a good reason for why you are out of breath. Hidden waterfalls, glacial lakes and a bald eagle were among our payoffs here. This place is magical. We felt renewed and re-invigorated with each hike and reminded that it was high time to head into the backcountry after talking with the two young girls nearing the end of their trip. We tried to cram as much as we could into the sunny days preceding the ominous weather forecast, but still find ourselves eager for more time in the Park, especially the Teton Ridge Trail. Yes. Yes. Yes. Grand Tetons NP is not as well-known or as crowded as its northern neighbor, but it is just as accessible, just as beautiful, and just as unpredictable when it comes to weather. We strongly recommend checking the forecast before heading into the Tetons. We may not have been so enthralled had the road out been closed because of snow. Yellowstone National Park is a diverse natural wonderland roughly twice the size of the state of Delaware. We have broken our Yellowstone reviews into three separate entries: the North, Central and South because of the Park’s immense size and staggering variety of experiences.. The South portion of Yellowstone National Park offers a wide array of tourist activities. It lies almost entirely within the Yellowstone caldera. The caldera is a remnant of tremendous supervolcanic explosions. It is the depression left behind by the reverse impact of the supervolcano’s debris. The supervolcanoes’ still active magnetic heat is partially responsible for the geyser fields and hydrothermal activity. The South’s prime attraction is the incredibly active Lower Geyser Basin, which includes the Fountain Paint Pot and the Great Fountain Geyser. The Upper Geyser Basin is home to five predictable geysers including the Park’s poster child, Old Faithful. 70% of the Park’s geysers and hydrothermal activity occurs within this small area. The 17-mile road east of the Geyser Basin crosses the Continental Divide twice before arriving at the West Thumb of Yellowstone Lake. The nearby Grant Village Visitor Center tells the story of the 1988 fires that swept through this area, burning over a 1/3 of the Park’s acreage. The blue expanses of Yellowstone Lake provide stellar fishing, bird watching, hiking and paddling. The wildlife-rich Hayden Valley, the stretch of the Yellowstone River going upstream from the Lake to the Grand Canyon of the Yellowstone is also home to two malodorous geothermal sites called Mud Volcano and Sulphur Canyon. Yellowstone NP’s wide array of colors is absolutely dazzling. The thermal fields produce oranges, blues, whites and greens in indescribable hues. They combine with the yellow meadows, the changing leaves and a crisp blue sky to create masterpieces. Cameras cannot capture Yellowstone. Boiling water falls into creeks. Steam bellows off rivers. Lone Bison bulls sit by the road. Bald eagles and osprey swoop overhead. Waterfalls roar from all directions. An eternal mist lingers and then rushes from above the earth’s vents. The cold blues of Yellowstone Lake stretch for miles. Youthful lodgepole pines sprout everywhere. This place teems with life. It is nature. It is beauty. You need to see Yellowstone to believe it. In 1872, Yellowstone became the world’s first National Park, the first time land had ever been set aside for public use. Yellowstone NP served as the initial model for the conservation of our precious landscape. The flight of the Nez Perce in 1877 took them from their Idaho homeland to their defeat at Bear Paw Battlefield took them through this section of Yellowstone NP. A few tourists were taken hostage and one was even killed. What a difference two weeks make. In late August, there are still lots of kids at Yellowstone NP. When we returned in early September, the diverse crowds remained but the kids were conspicuously missing. Now we were the young whippersnappers. Michael was out-of-control giddy in the Upper Geyser Basin, speed walking from place to place hoping to catch every explosion. The many people he passed invariably commented, “do it while you can, young one,” or “when I was your age…” We loved it. Despite the cold, calmness pervaded over some of the elderly vacationers. They slowly walked hand in hand with content smiles, not caring about Old Faithful scheduled explosion, just amazed at the beauty around them. Others were eager to see the geyser bursts, but none perhaps more unruly than Michael. Both the South Entrance and the East Entrance lead into the South portion of Yellowstone NP. The East Entrance is 52 miles west of Cody, WY via U.S. Route 20 and not near any Interstate. The South Entrance incorporates the John D. Rockefeller MEM PKWY and leads directly into Grand Teton NP. While getting to remote northwestern Wyoming may pose problems, the Park, itself, is very accessible. Numerous pull offs and picnic areas allow the motorist to see oodles of wildlife. The entire eight-mile stretch from the Lower Geyser Basin to the Upper Geyser basin is virtually connected with boardwalks, paved walkways and accessible trails. Yellowstone NP’s Rangers’ herculean efforts ensure the visitor an optimum experience. The Yellowstone Association operates four bookstores in the South and eight in the Park as a whole. All eight have distinct National Parks Passport Stamps. Gotta get ’em all. Gotta get ’em all. There are seven restaurants/cafeterias in the South, three at Old Faithful, two at Lake Yellowstone and two at Grant Village. The food looked a bit over-priced, but, geez, what can you do, the Park is bigger than two States. A $20 vehicle entrance fee is good for a week’s stay at Yellowstone NP and Grand Teton NP’s combined 2.5 million acres. Entry is free, free, free with the National Parks Pass. Xanterra Parks and Resorts runs three of the four campgrounds in the South. The small city sized 432-site Bridge Bay and 425-site Grant Village Campgrounds are available through Xanterra. The 346-site Fishing Bridge RV Campground cost $31 per night and is an RV-only campground. These three accept reservations. We stayed at the charming 85-site, tent-only NPS-run Lewis Lake Campground. First-come first served baby. That’s what we’re about. Lodges are plentiful in the South, three in the Lake Yellowstone vicinity and three nearby Old Faithful. Xanterra Parks and Resorts runs them all. The South boasts three large Visitor Centers all within 38 miles of each other. Grant Village and Fishing Bridge are well staffed, easily accessible and helpful. In the summer, Ranger-led tours occur at the VC’s with ridiculous regularity. Fall and winter aren’t as active. If you come in fall (like us) go inside! Museums a plenty. We loved the The Fishing Bridge Museum’s wide variety of stuffed birds; mounted and on display as far back as 1931. The Grant Village Museum’s 1988 fire-themed displays showed how the American citizenry vilified the National Park for letting the fires rage. Rangers steadfastly averred that they must let nature take its course. Things will be OK. No one believed them. We remembered being so sad that we would never be able to see the grandeur of Yellowstone. Well most of us were wrong and the Park Service was right. Throughout the Park, 10-foot high and growing lodgepole pines stand underneath their scorched ancestors. The dead trees will soon fall with millions poised nearby to take their place. The cycle of life is very beautiful. Picture us scampering from geyser to geyser just waiting for them to burst. Hear us oohing and aahing so loud that we felt uncomfortable…for a second. Then we sighed in amazement some more. Yeah, this place is fun. If you come to Yellowstone NP, you have to see Old Faithful and the Upper Geyser Basin. It is as simple as that. If and when you do come, plan ahead and spend some time here. Yellowstone is so large and offers so much. Don’t just drive the 166-mile Figure Eight auto tour. You can’t see everything in one day. Spend some time in the Park. Get out of your car. and hike the 1,000+ miles of trails accessible to all skill levels. A Ranger told us, “everything is better in the backcountry.” She was right. The beautiful thing is that almost all of Yellowstone is backcountry. Walk twenty feet from the road and you are in a natural state. The Park is wonderful. Yellowstone NP is one of America’s crown jewels. Because of the Park’s immense size and staggering variety of experiences, we have broken our Yellowstone reviews into three separate entries: the North, Central and South. The forty-mile stretch of road that travels west to east from the West Entrance of the Park to the Upper and Lower Yellowstone Falls. The Central portion of the Park roughly skirts the northern boundary of the Yellowstone caldera. This section includes two prominent geyser basins, Norris and Monument. The Norris Geyser Basin is home to Steamboat Geyser, the world’s tallest active geyser. Central Yellowstone is most noteworthy for the stunning Upper and Lower Yellowstone Falls and the Grand Canyon of the Yellowstone. The pink canyon walls of the Grand Canyon of the Yellowstone are astounding. The views of the upper and lower Falls do not seem real, more like a painting. There is a reason the overlook is called Artist Point. The Museum of the Park Ranger is located in the Norris vicinity. The Museum, staffed exclusively by retired Park Rangers and located in the old Norris Soldier Station, tells the story of an important and often forgotten American educator, law enforcement officer and conservationist: the National Park Ranger. Few hikes exist in the Central area of the Park and the tourist is forced to appreciate the terrain along a crowded auto tour route. The Park brochure warns “Canyon and falls visible only from overlooks along canyon rims.” It does not lie. The overlooks are very crowded. Barreling buses, running children, ongoing roadwork, unmarked centerlines, camera induced tunnel vision tourists and limited parking make the canyon area a nightmare despite its overwhelming beauty. Central Yellowstone can be accessed through the Park’s West Entrance, the town of West Yellowstone, Mont. West Yellowstone is 89 miles south of Interstate 90 and Bozeman, Mont. via U.S. Route 191. The West Entrance is also 111 miles northwest of Interstate 15 and Idaho Falls, Idaho via U.S. Route 20. The Central portion of the Park forms the middle bar of the Figure Eight auto tour. We ran into lots of construction and detours; hopefully now the roads have been completed. The very accessible Norris Geyser basin can be closely viewed due to an extensive boardwalk system. No falling into boiling water here. The Yellowstone Association runs three stores brimming with books and goodies in the Central region, at Madison, Norris, and Canyon Village. For our fellow geek stamp collectors, all three have distinct National Parks Passport Stamps. When 7:30 p.m. temperatures dipped below 35 degrees, we were thrilled to find a lounge tucked behind another Canyon gift store and next to the Canyon dining room. We huddled next to the fire and enjoyed a moderately priced beer. The lounge was packed with families, other cold tourists. Oh, the stories we heard. America’s first National Park costs only $20 per vehicle entrance fee. And that includes Grand Teton NP. What a bargain. Those combined 2.5 million acres could be free if you own a National Parks Pass. The popular Central Yellowstone corridor has lots of lodging potential. The NPS-run first-come first-served Norris campground would have been our choice but it was full. So we settled for a spot in the mega-Xanterra Parks and Resorts-run 272 site Canyon campground where they choose your spot. Nothing stirs our wrath more than a freedom-less campground. Arrrgh we say, arrrgh. Once the freezing rain started, we appreciated our proximity to the Canyon Village and did not mind our predicament. One of us might even have wished for a night at the nearby Xanterra lodge. It is too bad that the Ranger facilities in the Central pale to their brethren in the North and South. The Canyon Village Visitor Center is just a trailer, dwarfed by the surrounding Xanterra gift shops and restaurants. Shouldn’t it be the other way around? We saw no Rangers at the Canyon overlooks. During summer months, three Ranger-led talks occur daily at the Norris Geyser Basin and an amazing 14 take place alongside the Canyon. We went on a guided walk through the Norris geysers, but left early because we were eager to explore on our own. Sorry Mr. Ranger but your Park just beckons, especially when the sky unexpectedly turns blue. But before we could get to the Canyon, the weather took a turn for the worse. All tours were cancelled and we were left wondering a) will it get better by tomorrow; b) can we wait it out in our tent; c) is it going to snow and d) what can we do in the mean time. We found out a) no; b) yes, frigidly; c) does two inches of freezing rain count? and d) not much at all. The Visitor Center at Canyon Village is just a trailer. No exhibits are on display and the videos are shown on a small television surrounded by a few plastic chairs. Because of the weather, the chairs were full and the trailer stuffed to the gills. Yellowstone NP is notorious for its temperamentally bad weather. It is a shame that the Visitor Center in one of its most popular areas is so inadequate. The next morning, after shaking off the shivers, we traveled to the delightful Museum of the National Park Ranger near Norris and located in the old Norris Soldier Station building. Our August 25 trip coincided with the 88th birthday of the Congressional creation of our Park system. We couldn’t think of a better place to be. The central portion of Yellowstone was not the highlight of our visit. Because of its altitude and geographic location, it is usually colder and wetter than Mammoth Hot Springs. It was no exception during our visit. We can handle being cold and wet (evidently not, it seems), especially since most of our time in the central region was spent in the car auto-touring. But add immense crowds, limited access to overlooks and road construction around every turn and you can see why we were eager to move on. Even at its least fun, Yellowstone is still heads and shoulders above other parks and still a must see. The Falls and the Grand Canyon are still breathtakingly beautiful. The Ranger Museum is still a hidden gem and an inviting place to spend a rainy morning. Yellowstone’s northern tier exists outside of the Yellowstone caldera and, as a result, enjoys a much greater variety of plant and animal life. Herds of bison roam the expanses of the Lamar Valley, joined by wolf packs, pronghorns and elk. Most of Yellowstone’s easily accessible mountain peaks are here in the North. Nearly all of the Park’s bighorn sheep live in the alpine terrain just south of Tower Fall around Mount Washburn. The North’s most famous attraction is Mammoth Hot Springs. This extensive system of multihued cascading hot springs is very similar in geological development and appearance to the interior of spectacular caverns like Carlsbad and Mammoth. At Yellowstone, nature has been turned inside out. The Mammoth Hot Springs exist outside the caldera and bubble and flow from the heat generated by the slow northeastward movement of the Jackson Hot Spot; the same Hot Spot that ten of thousands of years ago created the lava fields at Craters of the Moon NM and the rich potato-growing soils of southern Idaho. The North was the most beautiful part of the Park, especially the Lamar Valley. More wildlife, more diversity, higher mountains and supernatural hot springs. The area also boasts of a long and important Native American history. The obsidian found throughout the Park was the most widely traded good in North American for thousands of years. Indians ranging throughout the continent fashioned arrowheads almost exclusively from materials mined here. Everybody in the North was so happy. We encountered so many different and excited people many of whom gave us indelible memories. There is much space and a wide array of activities nearby: fly fishing, auto touring, wildlife watching, hikes along paved walkways and boardwalks, moderate hikes through valleys, strenuous hikes up mountains and little used backcountry trails. As soon as you venture away from the road, you see few people. The Beaver Ponds Loop Trail begins and ends in the heavily trafficked Mammoth Hot Springs area. Once we started hiking, we saw more elk than humans. Solitude is possible but hardly necessary given the giddy joy on all faces. North Yellowstone can be accessed from Interstate 90 in Montana via U.S. Route 89 and U.S. Route 212. Route 89 travels 58 miles south from Livingston, Mont. to Mammoth Hot Springs. This scenic route follows the Yellowstone River the whole way and enters the Park underneath the imposing stone Roosevelt arch at the Park’s North Entrance. Route 212, the Beartooth Highway, is a 124 mile drive from Billings, Mont. It is one of America’s most scenic drives. Starting in Red Lodge, Mont., it climbs tremendous heights, eventually crossing the Wyoming border at the 10,947 Beartooth Pass. The road passes through the Custer and Shoshone National Forests and is every bit as stunning as the Going-to-the-Sun Road at Glacier NP. Understandably, it weather often makes it impassable. Route 212 enters the Park at Silver Gate, Mont., the Northeast Entrance, and travels 29 miles through the Lamar Valley before reaching the Yellowstone Figure Eight Driving Loop at Tower-Roosevelt. The Lamar Valley is home to much of the Park’s wildlife and is seldom traveled because it is outside the standard auto tour loop. The North section of Yellowstone NP forms the ? portion of the Figure Eight Driving Loop. Once you get to Yellowstone, the Park is very accessible. Numerous pull offs and picnic areas allow the motorist to see oodles of wildlife. Mammoth Hot Springs can be closely viewed due to an extensive boardwalk system that is constantly being rebuilt. Yellowstone NP makes incredible efforts to ensure the visitor an optimum experience. The Yellowstone Association runs eight different (and all outstanding) online bookstores in the Park. The Mammoth Hot Springs Visitor Center hosts their only store in the North. Two full-service dining rooms, one at the Roosevelt Lodge and one at the Mammoth Hot Springs Lodge offers meals and full Verizon cellular service. A $20 vehicle entrance fee is good for a week’s stay at both Yellowstone NP and Grand Teton NP, an incredible bargain given the sheer amount of things to see in the Parks’ combined 2.5 million acres. And it’s all free with the National Parks Pass! The North has five campgrounds and 237 campsites; all NPS-run and first-come, first-serve. Mammoth campground is Yellowstone’s only year-round campsite. These are some of the Park’s most popular car camping sites and often fill up early. There are Xanterra-run lodges, cabins and hotel rooms at both Roosevelt and Mammoth. Backcountry camping is free. If you’re the worrisome type you can make ahead of time reservations for $20 per trip. Rangers are everywhere and they do a terrific job. Amidst the madness of the heavily touristed Mammoth Hot Springs Visitor Center, Gab received day hike brochures covering six of the Park’s major areas. The Ranger took the time to pick out her favorite hikes on all six and explain that she has made a concerted effort to try them all. Her picks were all stellar. A zoologist Ranger spots wolves along the Lamar Valley road nearly every day. Her stories of the wolf pack soap opera-esque saga are legendary. Yellowstone NP offers so many Ranger Programs that it distributes an 8-page newspaper handout to everyone entering the park regarding these tours. The number of programs tapers severely as the seasons change and the weather turns nasty. Take a tour here. The Rangers are great. We took the Mammoth Hot Spring Terrace Walk during what was technically summer. The cold rains came and our delightful Ranger immediately made sure to put the plastic weather guard on her signature straw hat. The weather did not deter our tour, but it was nice to linger in the warm steam of the Hot Springs. We gained a good understanding of the tricky geological notions of calderas, supervolcanoes, hot spots and travertine formations. Her talk was a remarkable introduction to the mystical steaming world of Yellowstone. For $0.50 a pop, the Yellowstone Association provides helpful glossy, color self-guided trail booklets for nearly every sub-section of the Park. The Mammoth campground hosts were greeted by us every morning as we extended our stay “just one more day”. This happened three times. Rangers told us that the best hikes in the Park are in the North. We have no reason to argue. The North also felt less crowded and more off the beaten path. The outsourced lodges, campsites and gift stores have less of a presence. If it hadn’t been for the crazy weather we don’t know if we ever would have left. Oh my heavens yes. Yellowstone NP is the classic National Parks destination. Much to our delight the Museums, tours, staffing and bookstores are all equal to the stunning natural surroundings. Everything here is done right. We loved the North and would love to spend days, if not weeks, in the backcountry here sometime soon. We spent so little time at Bighorn NRA that we cannot fairly offer you a full review. The best things about Bighorn Canyon National Recreation Area were the Indian tacos we ate in Crow Agency, Mont. before our stop and our night in Billings, Mont. after it. Between detours and dead end roads we spent more time trying to reach the Site than we did at the Site. 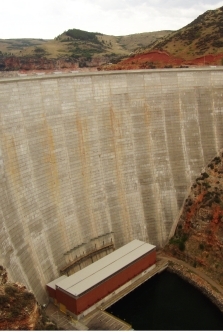 Tours of the Yellowtail Dam had been suspended because of a high security alert. And the only thing at the end of another long dead end drive down to Bighorn Lake were high-powered motorboats and sport fishermen. So we left.